【鳥】 ミヤマガラス 《群居して巣を作る; ⇒crow２ 【解説】》. 【チェス】 ルーク，城将 《★将棋の「飛車」に当たる動きをする; 略 R》. From Middle English rok, roke, from 古期英語 hrōc, from Proto-Germanic *hrōkaz (compare Old Norse hrókr, Saterland Frisian Rouk, Dutch roek, obsolete German Ruch), from Proto-Indo-European *kerk- (“crow, raven”) (compare Old Irish cerc (“hen”), Old Prussian kerko (“loon, diver”), dialectal Bulgarian кро́кон (krókon, “raven”), Ancient Greek κόραξ (kórax, “falcon”), Old Armenian ագռաւ (agṙaw), Avestan 𐬐𐬀𐬵𐬭𐬐𐬀𐬙𐬀𐬝‎ (kahrkatat̰, “rooster”), Sanskrit कृकर (kṛkara, “rooster”)), Ukrainian крук (kruk, “raven”). 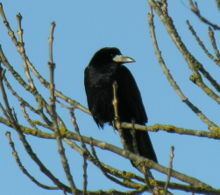 The rook […] should be treated as the farmer's friend. I am, like an old rook, who is ruined by gaming, forced to live on the good fortune of the pushing young men. (Britain) A type of firecracker used by farmers to scare birds of the same name. A trick-taking game, usually played with a specialized deck of cards. A bad deal, a rip-off. (transitive) To cheat or swindle. Some had spent a week in Jersey before coming to Guernsey; and, from what Paddy had heard, they really do know how to rook the visitors over there. 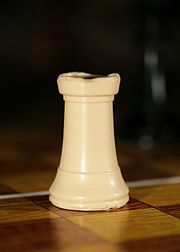 From Middle English rook, roke, rok, from Old French roc, ultimately from Persian رخ‎ (rox), from Middle Persian lhw' (rox, “rook, castle (chess)”), possibly from Sanskrit रथ (ratha, “chariot”). Compare roc. (まれに) A castle or other fortification. From Middle English roke, rock, rok (“mist; vapour; drizzle; smoke; fumes”), from Old Norse *rauk, related to Icelandic rok, roka (“whirlwind; seafoam; seaspray”), Middle Dutch rooc, rok, Modern Dutch rook (“smoke; fog”). Eye dialect spelling of look.